“Accident and sagacity while in pursuit of something else”, as Walpole put it himself, is the most economical and precise way to the describe Serendipity. [ii] A crucial point in my quest for defining and conveying Serendipity, a term coined by Horace Walpole in the 18th century while referring to an ancient Persian tale - The Three Princess of Seredip -, was both to follow this most authentic (and synthetic) definition and also to be able to retrace the definition process in itself. To accomplish this, my work was influenced by, and even contained voice recordings of, the original The Three Princess of Seredip and Voltaire’s Zadig. [iii] The latter, I’ve come to find, being a piece written also under the influence of the former. The almost quarter long research and composition process for this project culminated on a ~20 min long performance. This had four sections, named after Wapole’s keywords, which explored different music compositional approaches, as well as different audio & video relationship. One of my main goals, on which I was very succesful, was to blend between all sections seamlessly as if they all belonged to one and the same composition. And given all the complexity of this project - with multiple audio and video channels being processed in real-time -, I would also consider it to be a technical accomplishment finding this perfect balance that enabled it to be run on a single computer. The performance started with Accident, a section with a free improvisation on the saxophone and generative visuals on the screens. The build-up from nothing set the tone and slowly filled the semi-lit space, with both light and sound. At the end of this section a continuous palimpsest of sound, hold by the electronics, crossed over to the following section, Sagacity, where a performed sampler reveals both the literary sources and some cues that will be used later, as well as some photographs animated in real-time with overlaying text of the same sources. 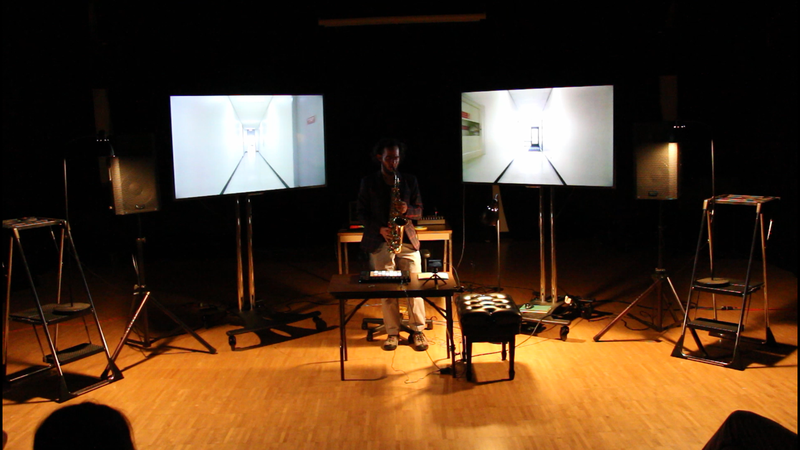 Pursue is the section that follows with a return of the saxophone and pre-recorded videos being cropped and looped in real-time. And the last section, that deals with live-video, some sort of telekinesis, and extreme sound-mangling, I named Something Else. With all these sections I was able to explore both the acoustic sound, as well as the processed sound; the slowly evolving images, as well as the fast paced and looped ones; some autonomous code, as well as code that needs to be controlled (performed) in real-time. 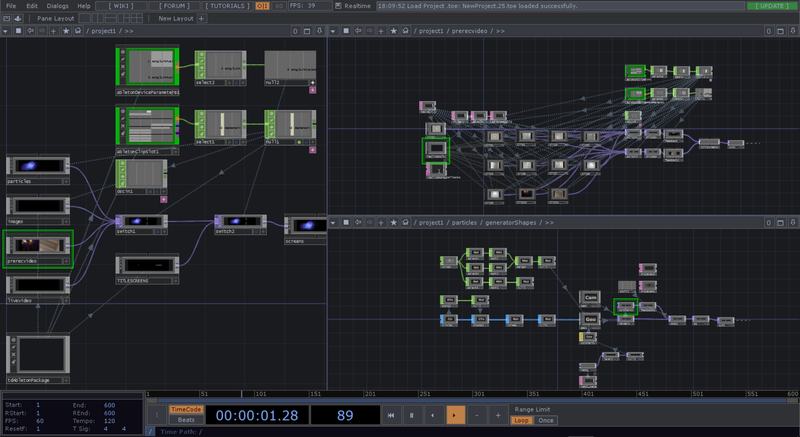 The amount of expertise that I’ve acquired while working with TouchDesigner will surely be helpful for my future work and has raised the curiosity of some of my colleagues. 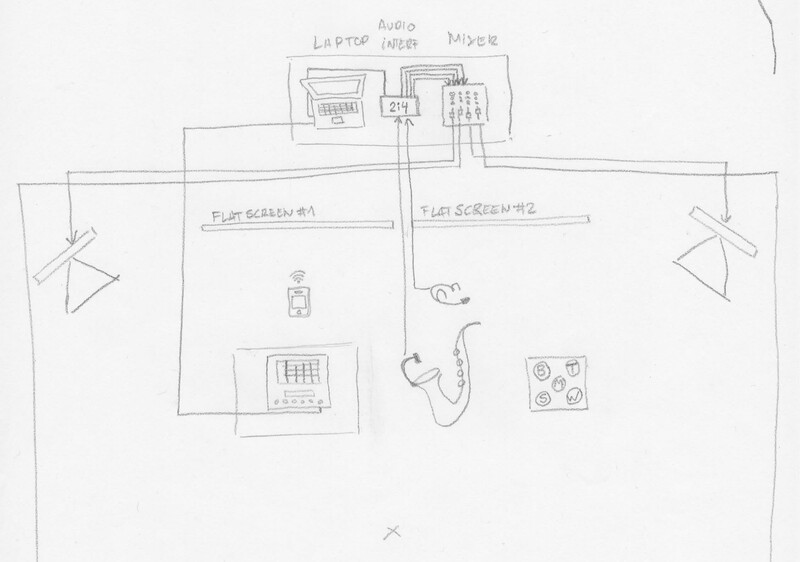 The preparation and programming of the Push controller[iv] and phone sensors involved, in order for it to be the only interface between the performer and the multiple software running on the computer, was an important and very challenging task to enable this multimedia performance. From the stage plan to the actual mise-en-scène, I was concerned with both the apparent simplicity and inherent complexity. 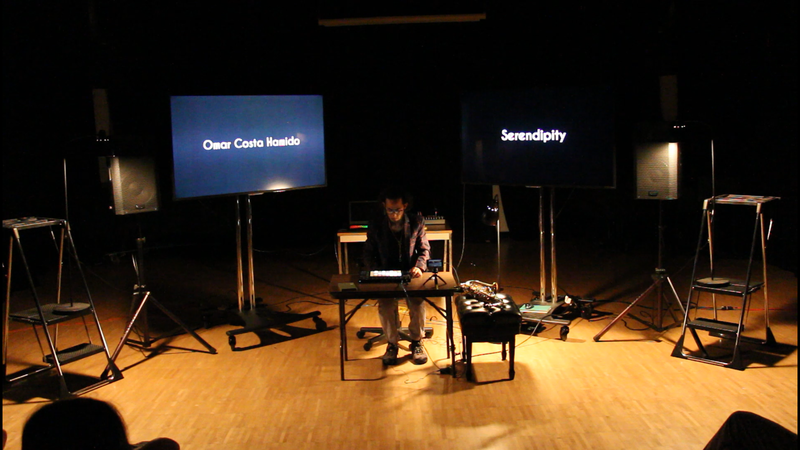 I didn’t amplify the acoustic instrument where it was not needed - saturation as a carefully thought variable -, and I purposely chose to work with 2 flatscreens - as with one screen it might look as music for those visuals, and with two the audience would be forced to take it as a whole. Even if the listener would only take this as multiple tales for amusement sake, as it happens to the king on the second half of the original Serendip tale, I would venture into saying that this continuous transfiguration, much like the one of Jesrad from Zadig, would resonate at some point or another, as a tale within a tale that happens to be the reality we were just looking for. [ii] Remer, T., & Cristoforo Armeno. (1965). Serendipity and The three princes, from the Peregrinaggio of 1557. ([1st. ed.].). Norman: University of Oklahoma Press. [iii] Voltaire, & Voltaire. (1964). Zadig : L’ingenu . Baltimore: Penguin Books.